It's Halloween! 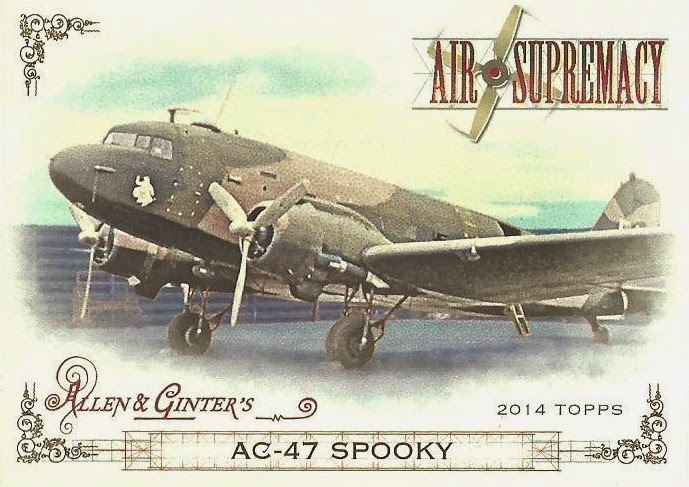 Here's a "spooky" card! The NBA Season starts today! The NBA starts today. 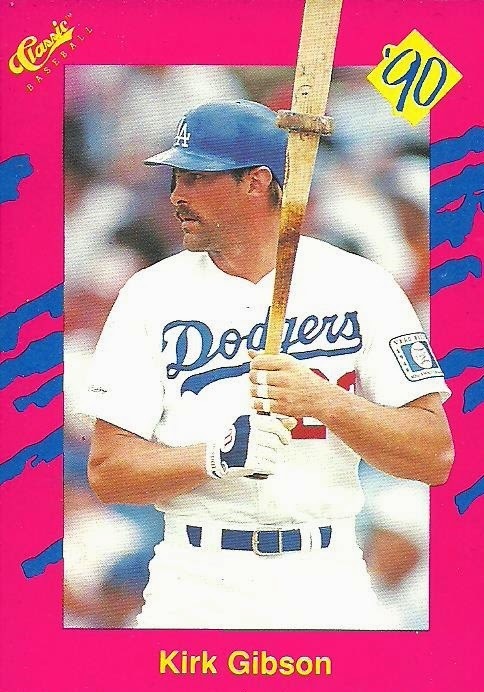 I thought I'd show off a baseball card. Rasmus, of the YouTube channel Holmbergs Corner, contacted me about sending me some D-Backs cards. We arranged a trade about a week later I got a package from Sweden. Thanks Rasmus! Go check out his YouTube channel. Check out what he sent me. 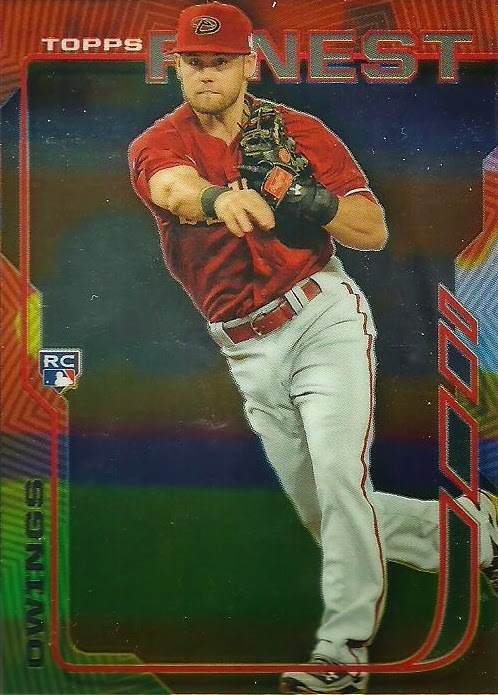 First up are a couple of Finest base cards including a Chris Owings RC and a Paul Goldschmidt, both of which I needed. 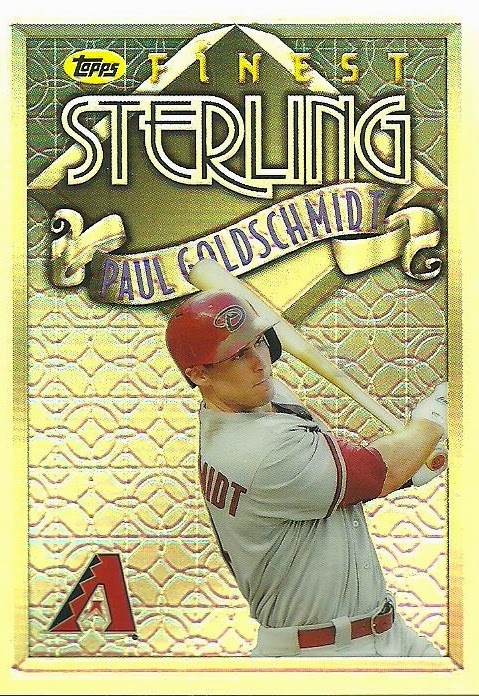 Next up is a sweet Finest Sterling insert card of Goldschmidt. Another card I needed. In fact, I didn't have any of the cards he sent. 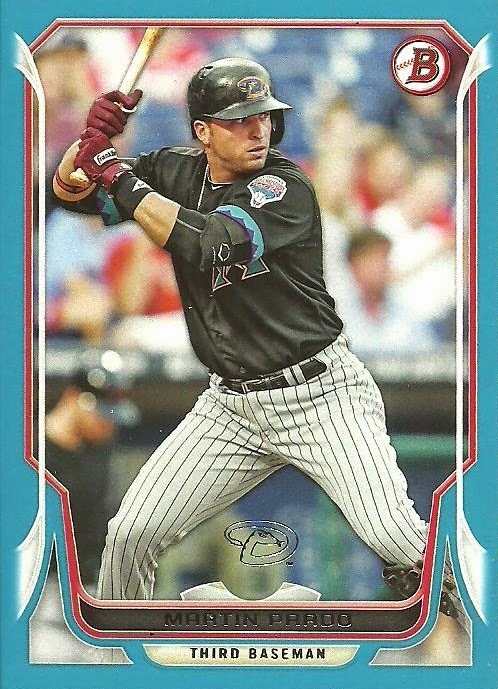 Here is a blue parallel of Martin Prado from 2014 Bowman. Next up are two autographs of Jake Barrett. 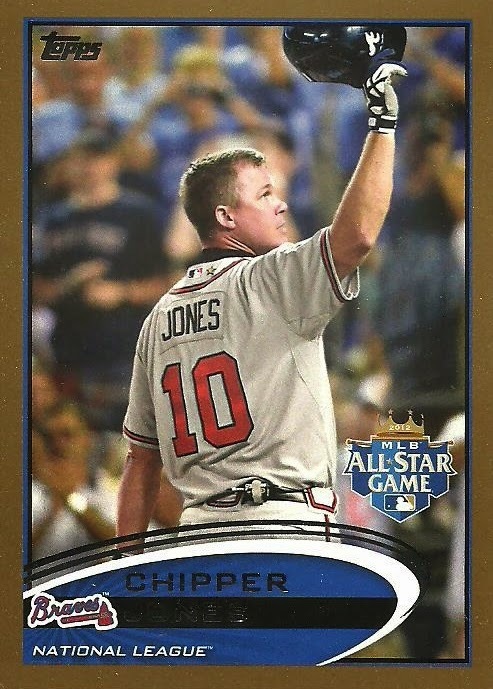 The base and then the gold parallel numbered to 50! 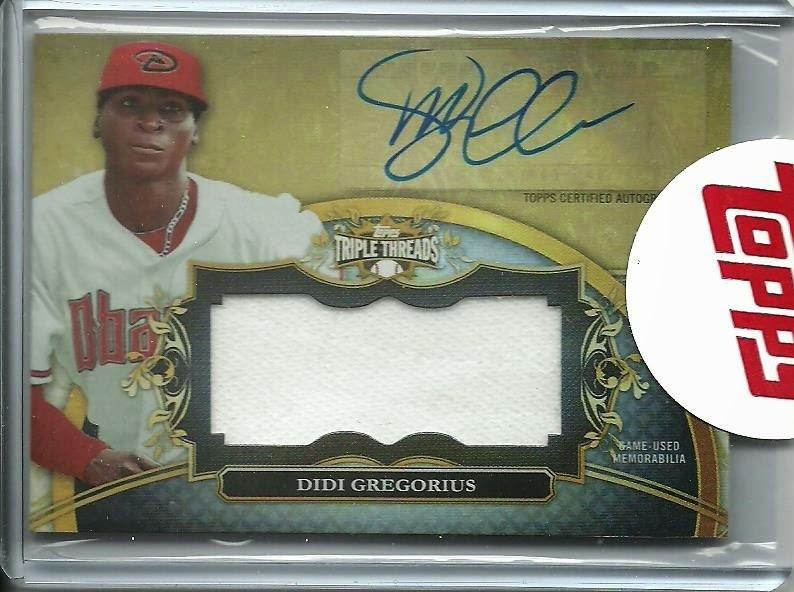 Finally, this 2014 Triple Threads jersey/auto of Didi Gregorious. 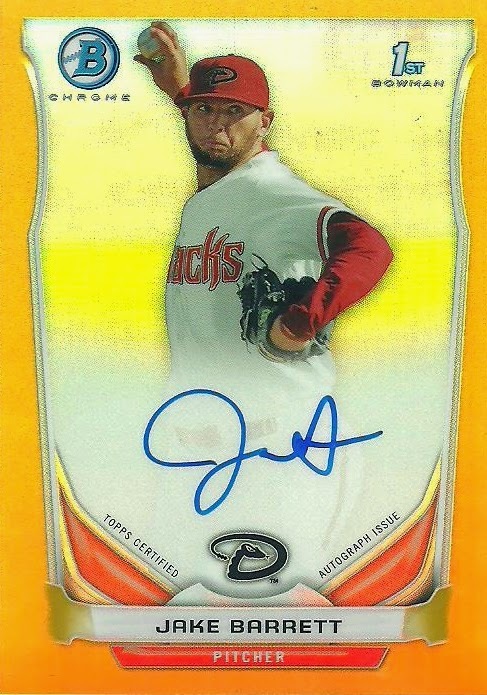 It must have been a redemption and so I thought I'd scan it with in the top loader with the Topps sticker on it. Thank you so much Rasmus! I'll be sending some Brewers your way soon! 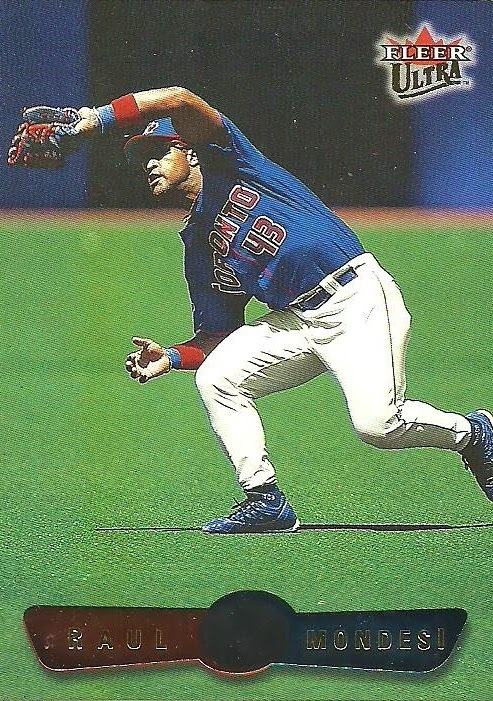 In Game 6 of the 1993 World Series with the Blue Jays leading the Phillies 3 games to 2, the Phillies took at 6-5 lead into the bottom of the 9th. 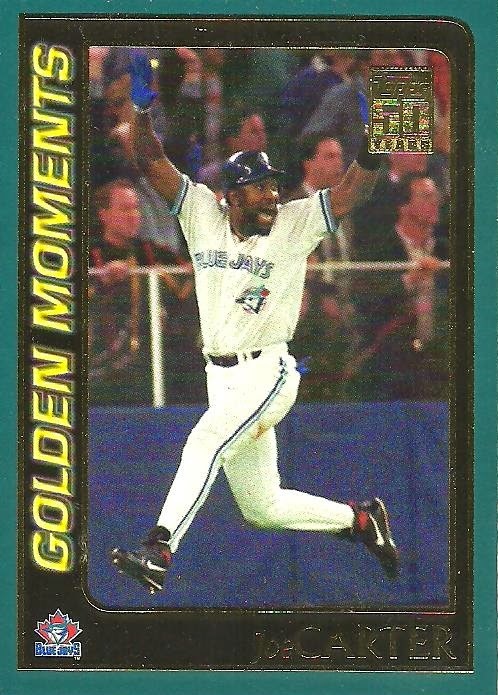 With two men on, Joe Carter came to the plate and hit a 3 run home run off Mitch Williams to win the game and the World Series in walk-off fashion. 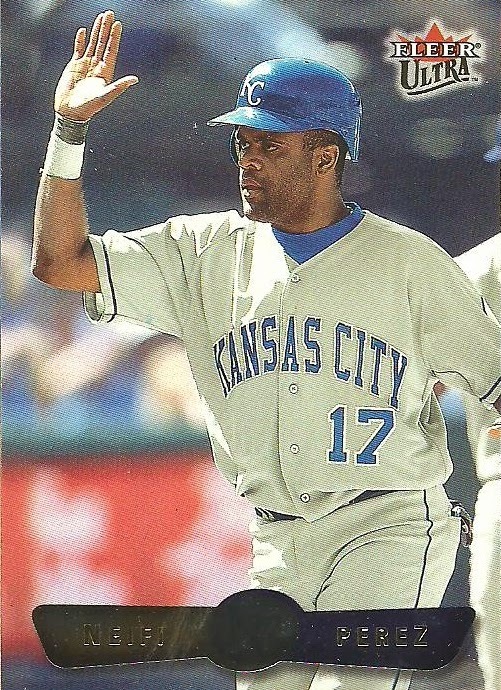 Not sure why I wasn't watching the game on TV, but I remember listening to this game on the radio and going crazy when Carter hit the home run. 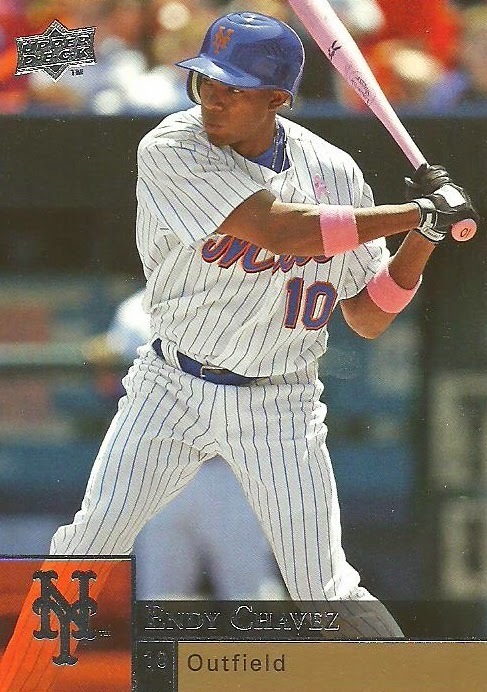 Robinson Cano was born October 22, 1982. 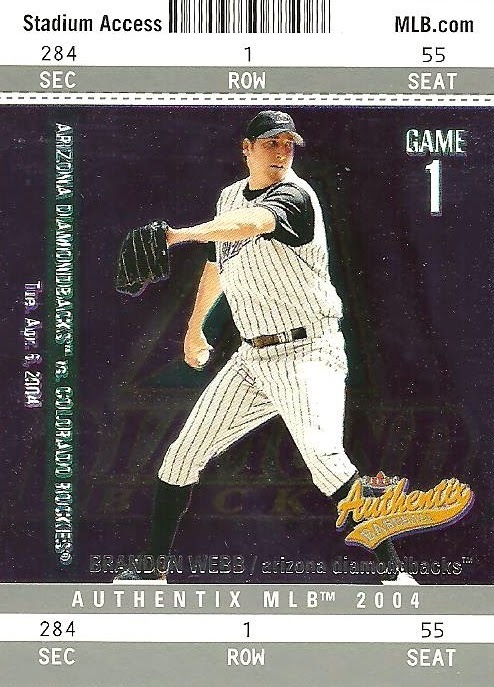 Here is his 2003 Bowman RC. 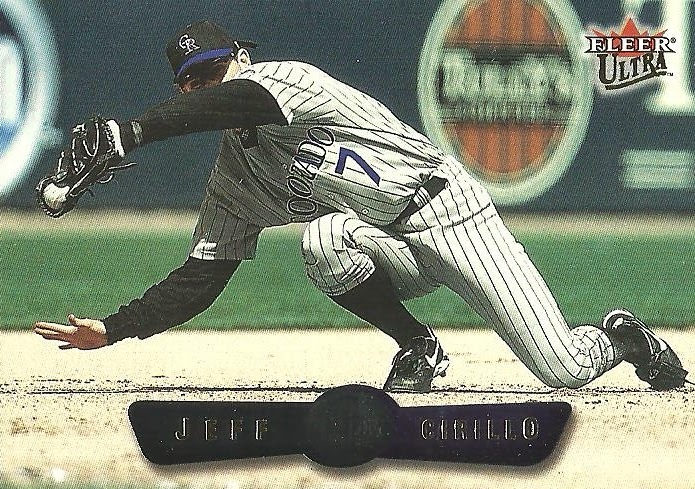 Here is a 2001 Topps Update All-Star Stitches. 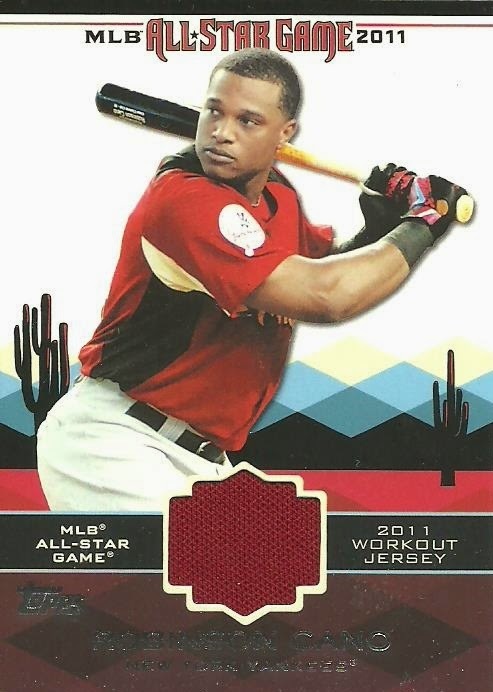 Since I was at the 2011 Home Run Derby, this is probably my favorite Cano card. 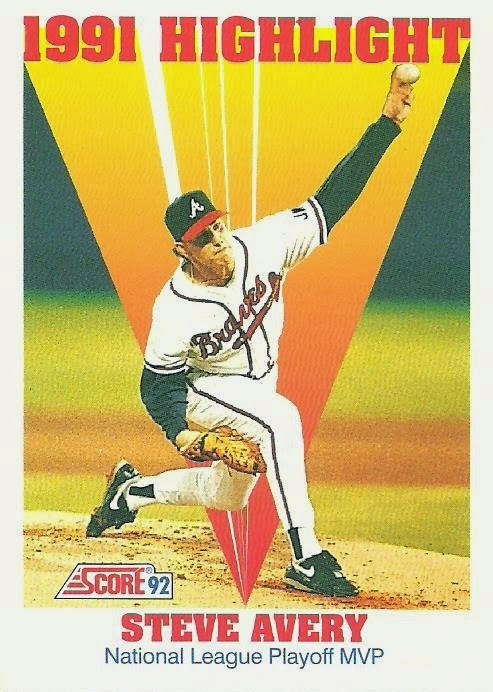 Steve Avery started Game 2 and Game 6 for the Atlanta Braves against the Pittsburgh Pirates in the 1991 NL playoffs. He pitched 8.1 shutout innings in Game 2 striking out 9 and at one point retiring 11 straight Pirates batters. The Pirates won 1-0. In Game 6, with the Braves trailing in the series 3 games to 2, Avery pitched 8 scoreless innings struck out 8 Pirates and the Braves won 1-0. The Braves would go on to win Game 7 and Avery was named NL Playoff MVP. Help save second base by commenting over at Pirates Treasure Room! Pirates Treasure Room is donating $1 for each comment on his blog this month to help Breast Cancer Awareness! 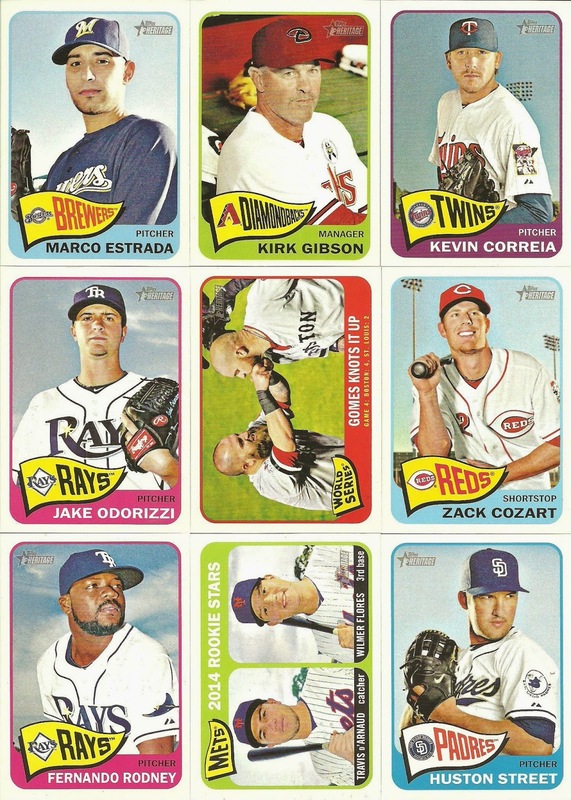 So go check out some awesome pink cards and leave a comment to help save second base! Here are a few cards I found recently that have some pink on them! 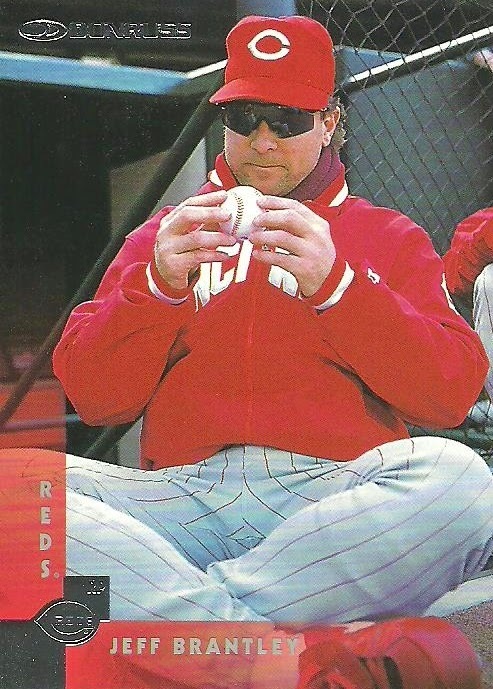 Give me your best caption for this card. Today is my 10th wedding anniversary. It's been 8 wonderful years. I know what you're thinking...I thought you said it was your 10th anniversary. You're right, but I said 8 "wonderful" years. There were two years that weren't so great. I love that joke and use it every year. My wife hates it, but she knows that's my thing so she puts up with it. My wife puts up with a lot and I'm a lucky man! My wife and I took a trip this summer to Denver to celebrate our anniversary, so we're just going to dinner and a movie tonight, no big gifts or anything like that. My wife got me a nice card though and inside the envelope were 3 packs of baseball cards; 2014 Series I, Series II, and Heritage. 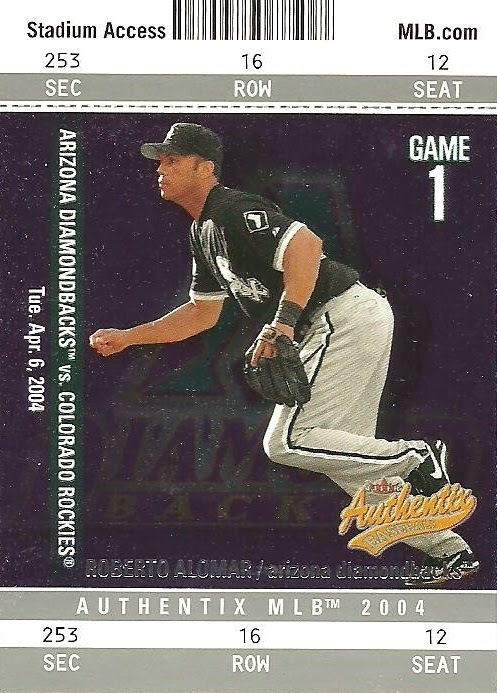 Two D-Backs and a Red Sparkle parallel, but my favorite card is probably the Molina card. Some nice action shots and another D-Back plus two cards that would look great signed ttm (Hamilton and Kershaw). Another D-Back. 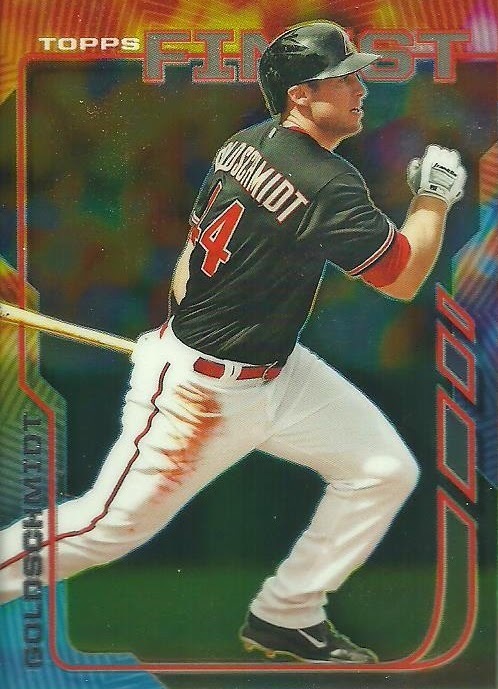 4 D-Backs in 3 packs is pretty good! I really like the World Series highlight card! One of my friends gave me his collection (minus the majority of his autos and relic cards) recently. He collected as a kid, so there are some cards from the early 90's and the majority was boxes from 2002 - 2006. Most of what he gave me was still in the boxes that he had bought. Every once in a while though there was a random pack. 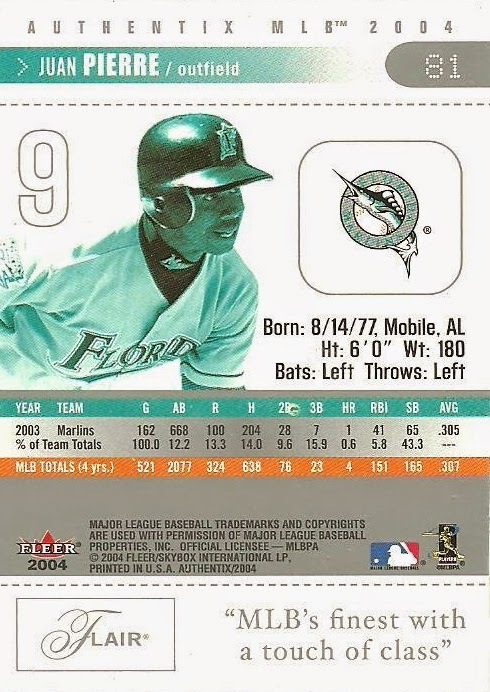 Here is a pack of 2002 Fleer Ultra. I imagine my friend was probably disappointed when he opened this pack; what with no autos or relics and not even an insert. 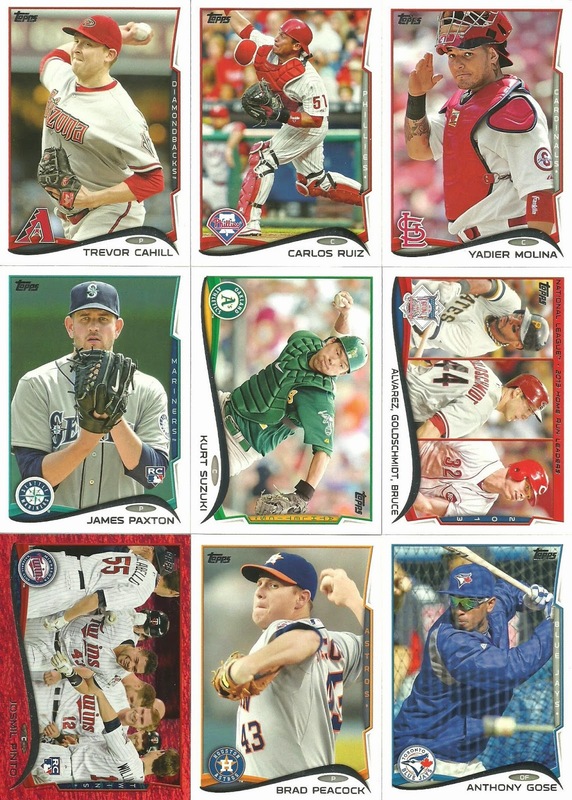 But I think it's a great pack and has a bunch of cards for my mini collections and player collections. 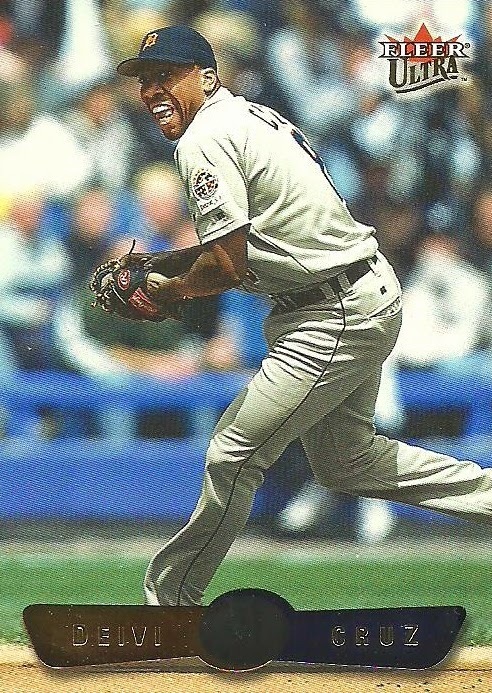 Fleer Ultra typically has top notch photography and it appears that 2002 was no exception. Just take a look! 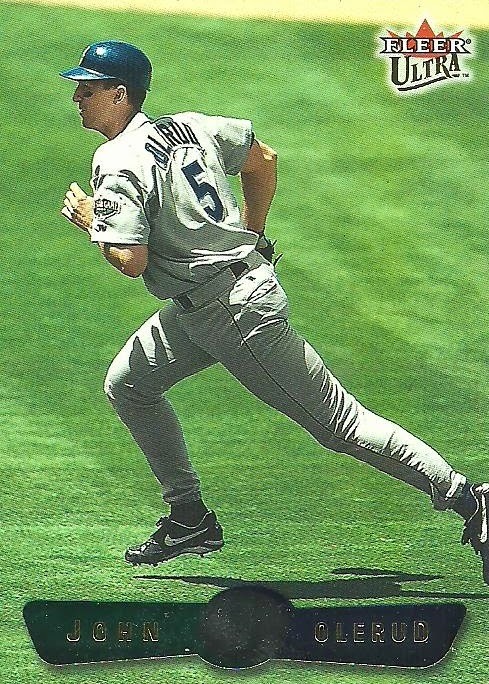 Here's a shot of John Olerud running in the outfield grass. 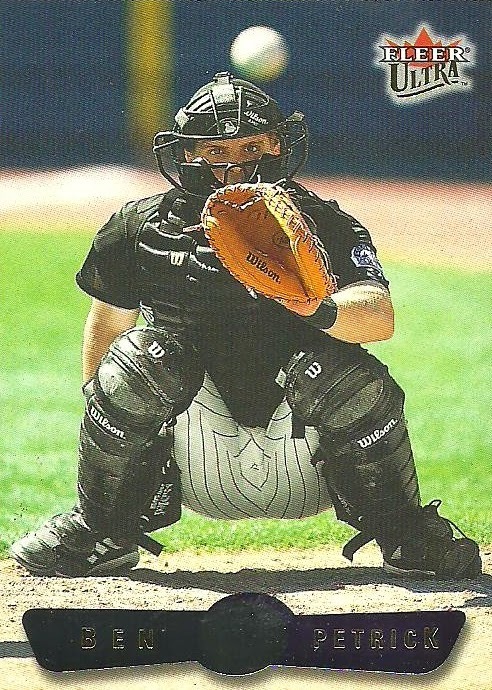 Since Olerud is a first baseman it makes me wonder what he was doing in the outfield with his glove on. 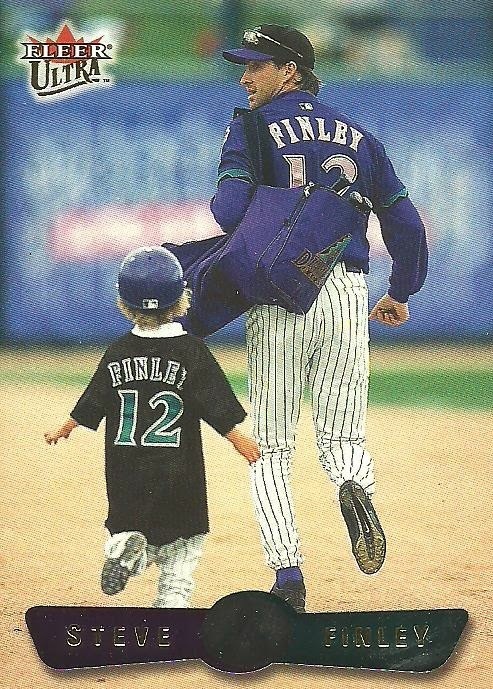 Love this shot of Steve Finley running the bases with one of his kids. 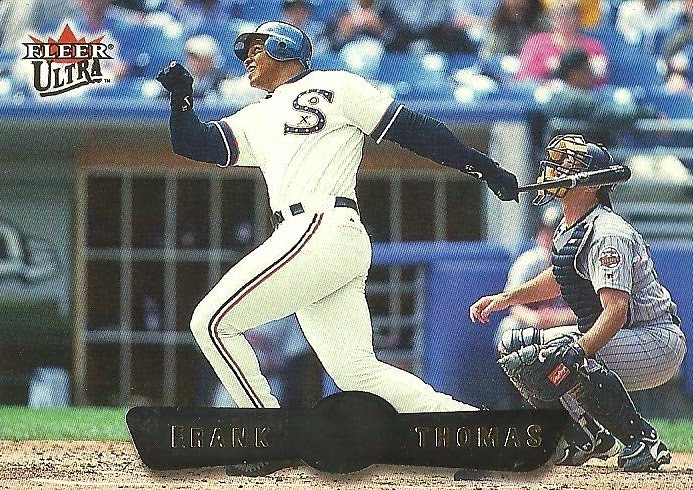 Great retro uniform shot of Frank Thomas. I've started a nice little Ben Petrick collection after seeing his inspiring story and this is an awesome card to add to that collection! Here's a great "Tatooine" shot of J.T. Snow. My friend recently gave me his collection (minus the majority of his autographs and relic cards) before he moved. Most of what he gave me was still in the boxes that he had opened. 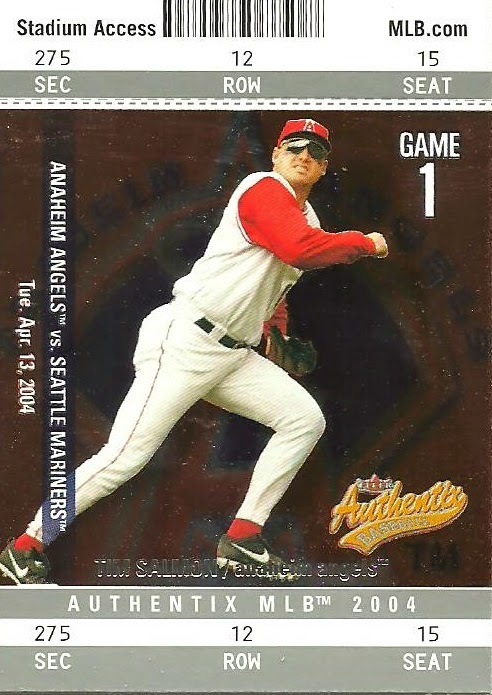 One of the boxes he busted was 2002 Fleer Authentix. I went through the cards last night and will use this post to share some of the cards and give my thoughts on the product. 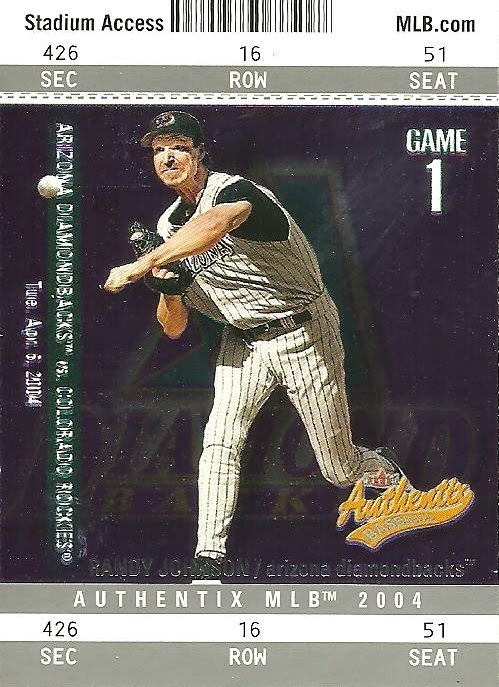 Fleer made Authentix Baseball from 2002 - 2005. 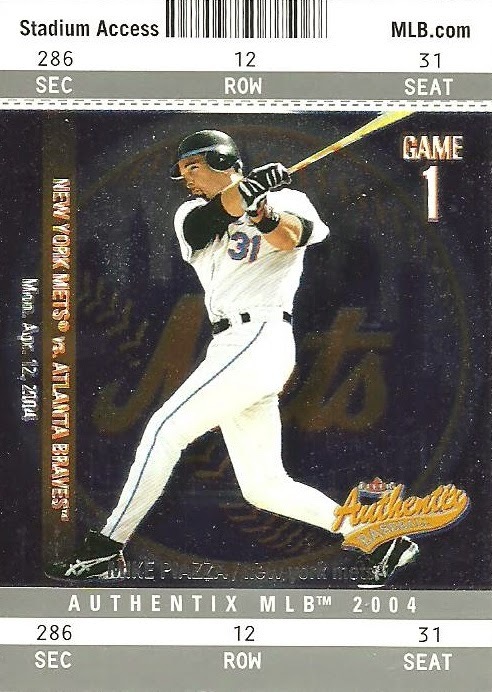 Fleer also used the Authentix brand to make football and basketball cards. There are 100 base cards in the set. 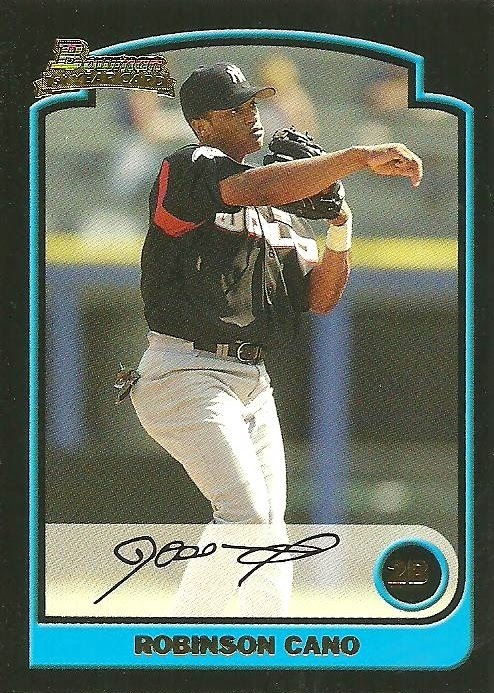 Cards #101 - #140 are rookie/prospect cards that are serial numbered on the back to 999. 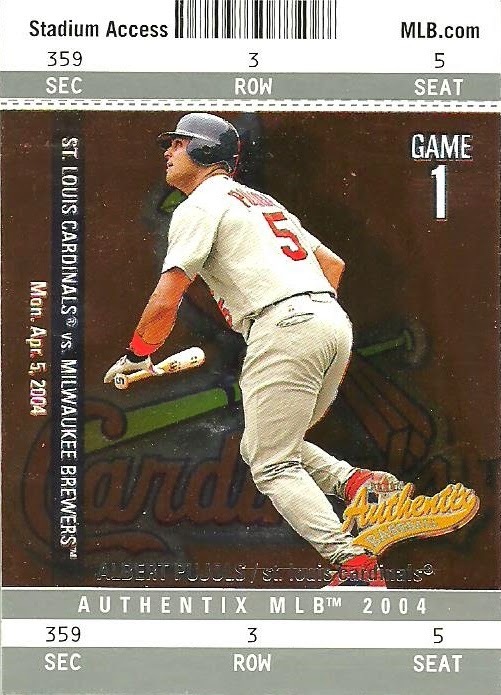 Albert Pujols has the distinction of being card #1. 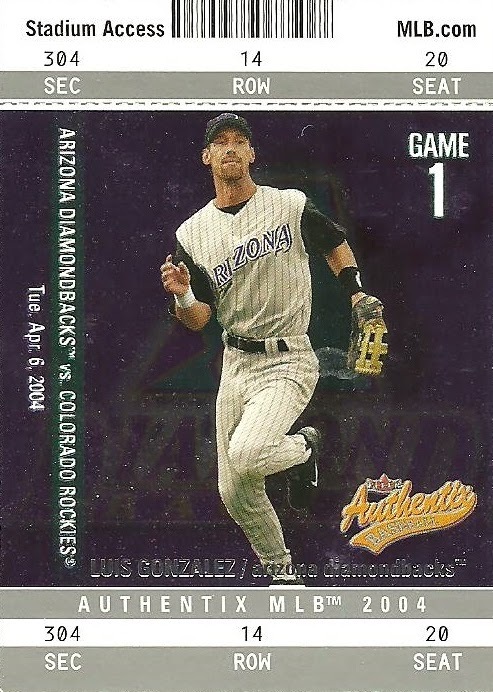 The front of the card looks like a ticket and looks a bit like 2009 Topps Ticket to Stardom. 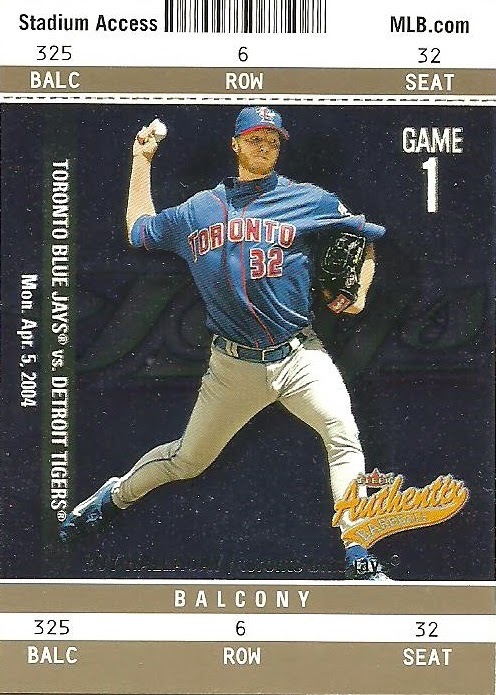 I haven't figured out the significance of the game listed on the front of the card. As far as I can tell they are all from various days in April and range from April 5th - April 23rd. I'm also not sure if there is a reason for the section, row, and seat numbers. If anyone has any ideas please let me know. The cards look better in person than they do scanned, but only if you hold it at the right angle. Here's the back of the card. They used the same photo on the back of the card as the front. They just cropped it. I wish they would have used a different photo. I do like the team logo on the back. 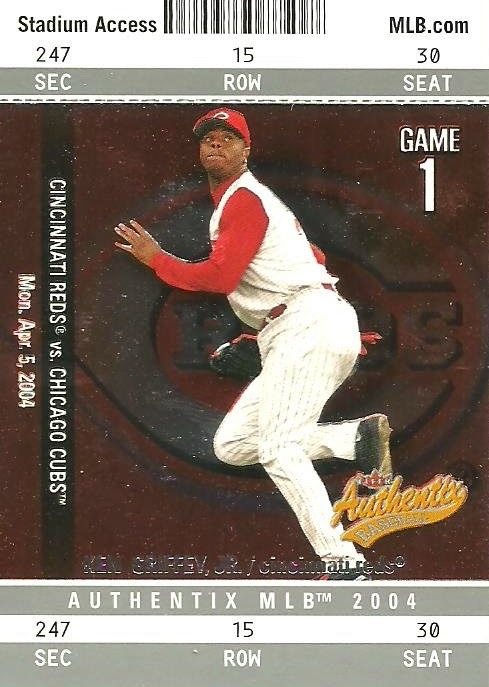 They also incorporated the team colors on the back of the card as well, which is a nice touch. The stats shown are from the 2003 season and there is also a line showing the % of Team Totals which I don't think I've ever seen before. MLB career totals are below that. 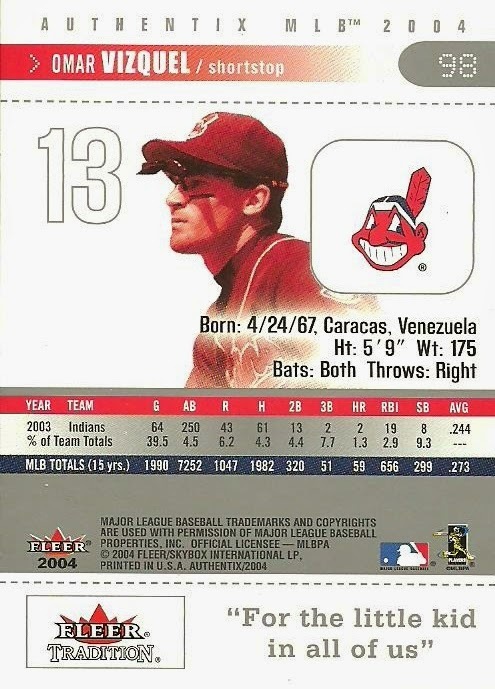 I wish there was some sort of write-up on the back of the card about the player. It feels like the gray area below the stats is wasted space. 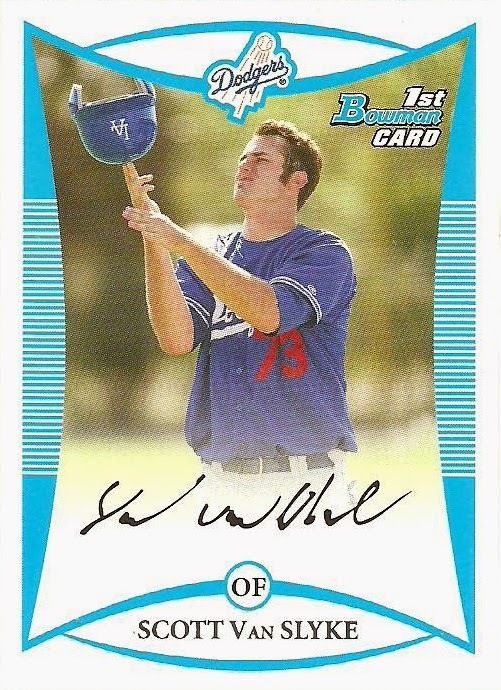 Although this space is used for serial numbering on the rookie/prospect cards as well as the parallels. 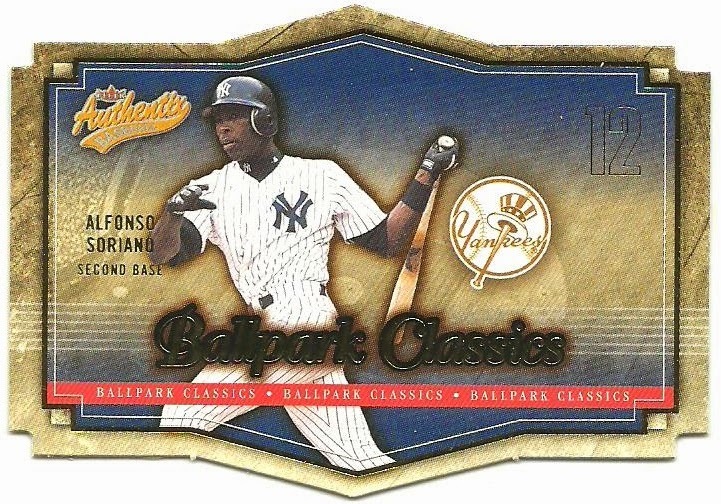 The bottom half inch or so contains an advertisement for a different Fleer product. 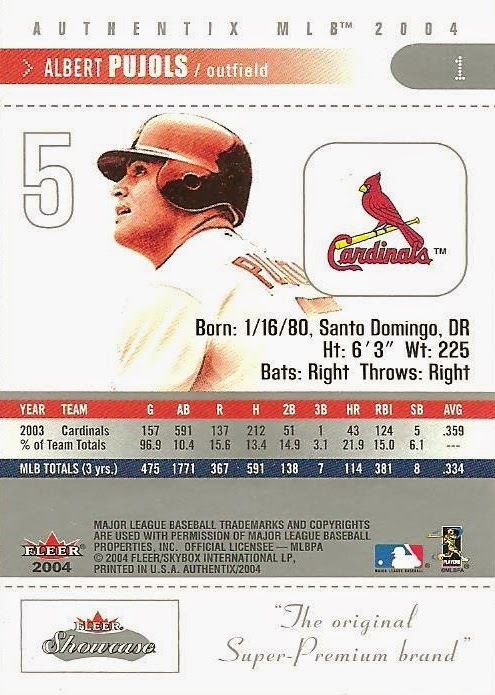 The Pujols card features an ad for Fleer Showcase. This Juan Pierre card has an ad for Flair and this Omar Vizquel card has an ad for Fleer Tradition. The Diamondbacks were well represented. In the base set of only 100 cards, they have 5 cards. 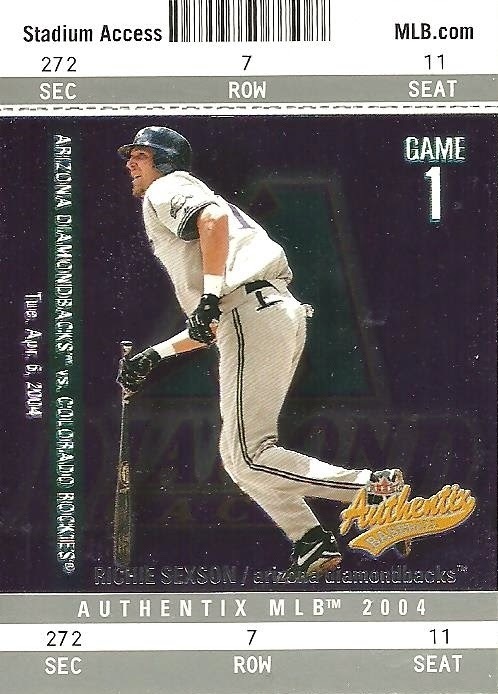 I don't know when the product was released but I wish they could have gotten Roberto Alomar and Richie Sexson in D-Backs uniforms. I ended up with just two doubles and am missing just 3 cards; #42, #76, and #95. The problem is, I'm not a set collector. Sure there are a couple sets that I've either put together or am in the process of putting together, but I've got no desire to have this set. 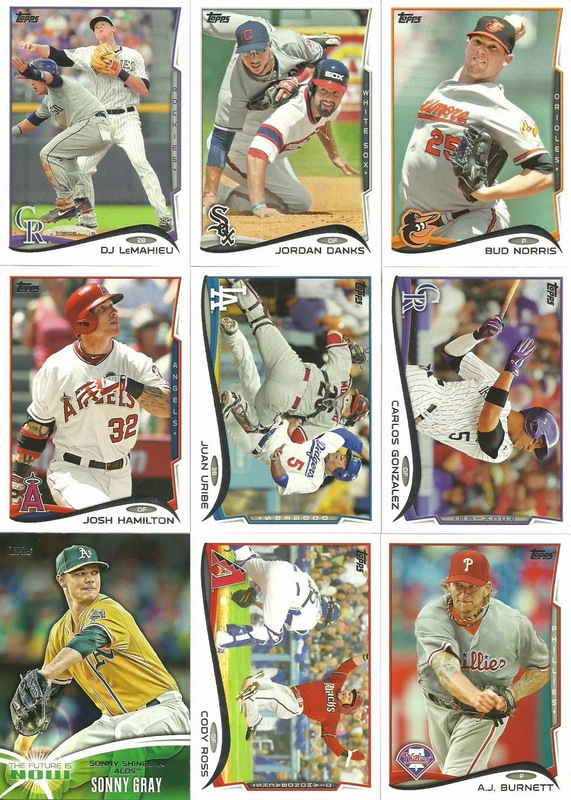 Here are a few cards of players that I collect. 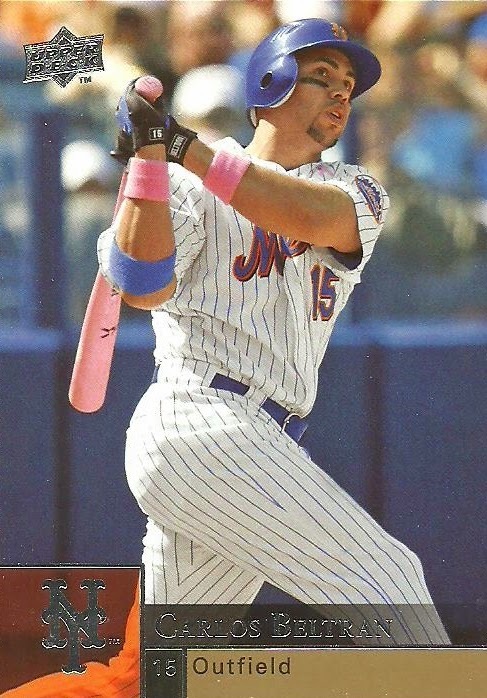 Griffey and Piazza are my two favorite players. I collected them as a kid but since my return to collecting I haven't actively added their cards to my collection, but I do set them aside when I come across them. 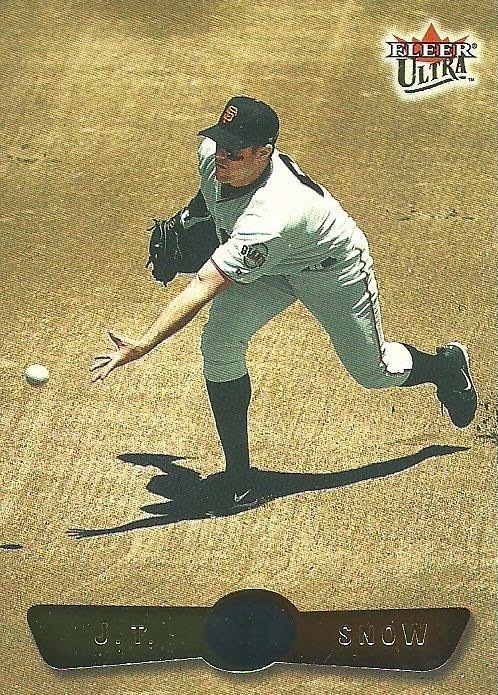 Tim Salmon went to the same high school that I did, so I've always set his cards aside as well. 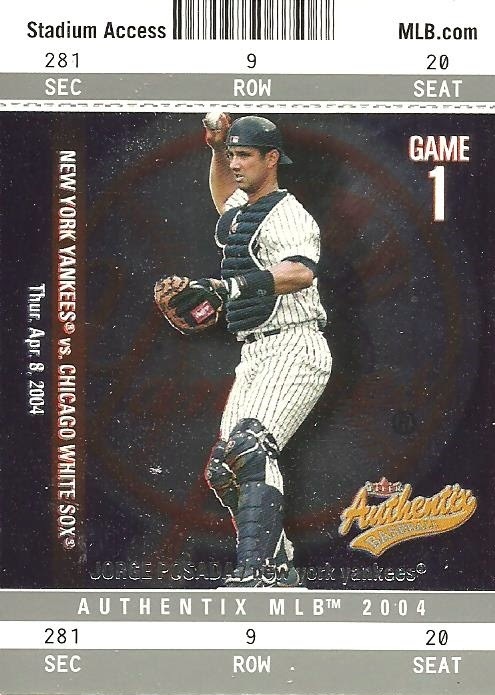 I only recently decided to start setting aside Jorge Posada cards.I don't have a real reason for collecting Posada other than I just like the way his cards look. 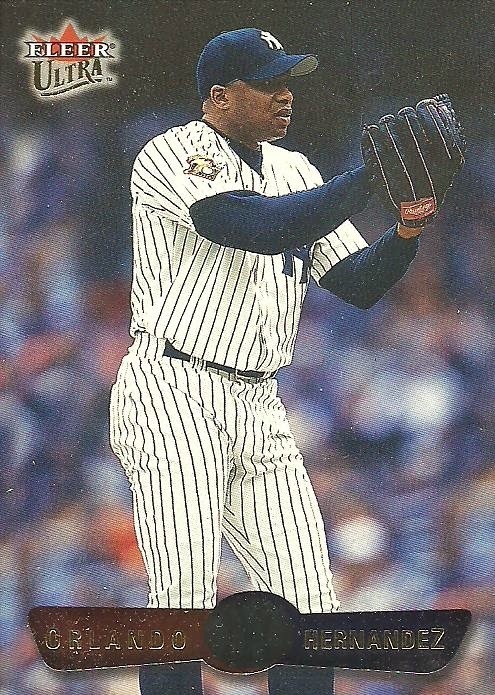 I also feel like he was a solid, but underrated player on a lot of great Yankee teams. There are parallel cards in the set and there was one in this box. 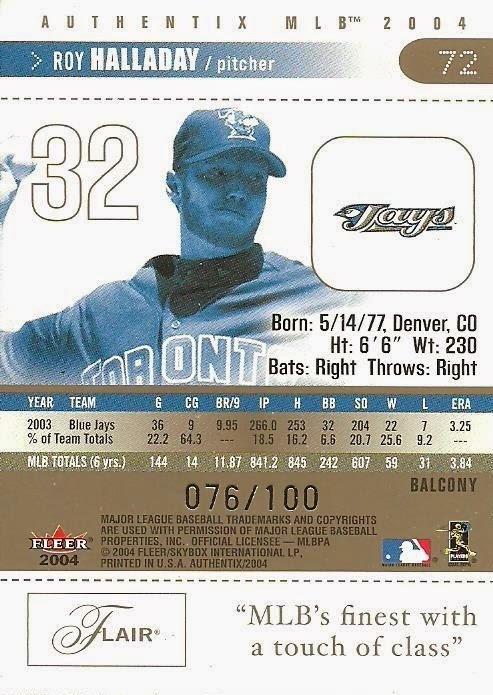 It's a Balcony parallel of Roy Halladay serial numbered on the back to 100. This particular box had three numbered rookie/prospect cards. 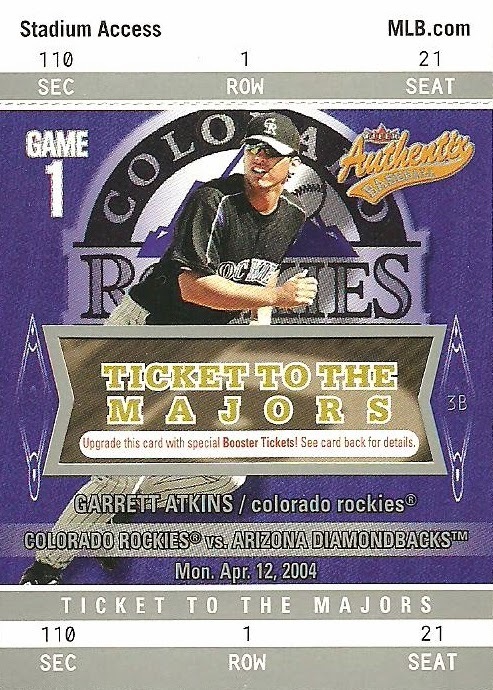 The part that has "Ticket to the Majors" on it slides out and can be replaced with a "Booster Ticket"autograph of the player. 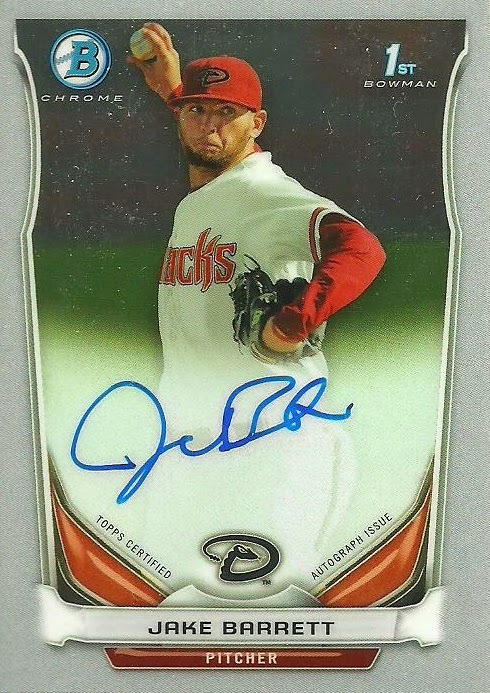 Got lucky and got a Diamondbacks player! 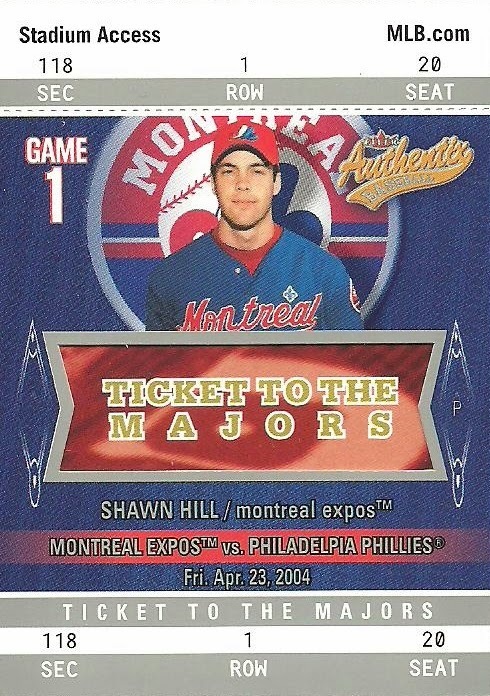 This Shawn Hill card has the insert that can be removed, but it doesn't have the part that says "Upgrade this card with special Booster Tickets! See card back for details. ", so I wonder if the Booster Ticket is not available for Shawn Hill. 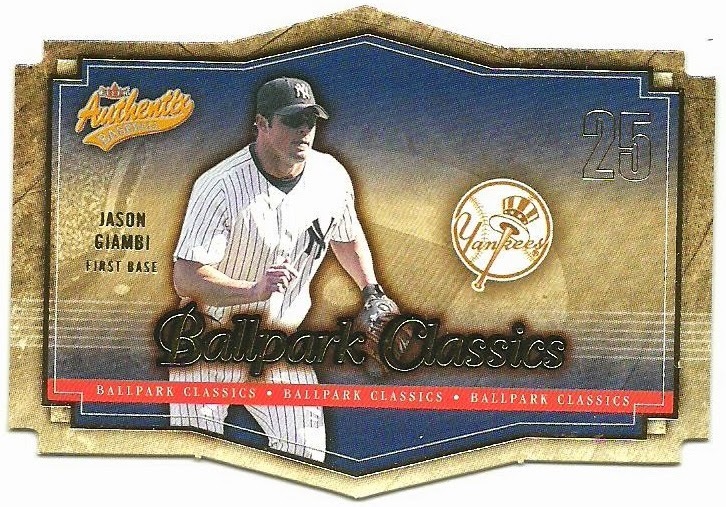 There were two Ballpark Classics cards in the box. Looks like a Yankee hot box! 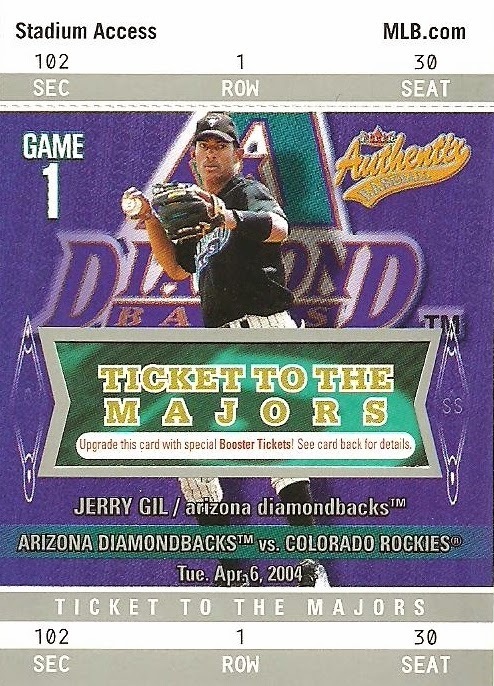 Finally, there were 4 of these Ticket Studs cards. They fold in the middle. A cool concept, but hard to enjoy when they are folded.